FOR IMMEDIATE USE: “It’s time to put The Innovation Principle’ at the heart of Europe’s economic revival,” said Mario Pinca, CEO of healthcare service leader, Copma. 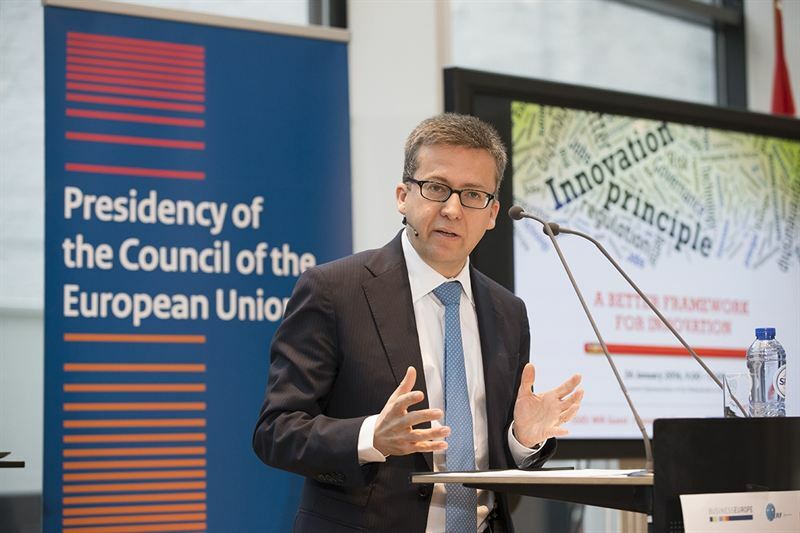 Speaking in response to a high-level conference in Brussels this week, Pinca said that Europe is lagging behind in innovation and economic development because it is too slow to recognise powerful new products and services. The conference, “A better framework for innovation”, was host by BusinessEurope, the EU’s leading business lobby group. Speakers from leading industrials giants such as Volvo, Bayer and BASF, joined European Commission Vice-President Jyrki Katainen (a former Finnish Prime Minister) and Carlos Moedas, the European Commissioner for Research, Science and Innovation, to pitch a new direction for Europe’s regulatory pathways. The industrialists made this pitch – put ‘The Innovation Principle’ at the heart of decision-making across all policy sectors. The conference heard how one of the key determinants of business success in today’s fast moving markets is the capacity to innovate, adapt and exploit new technologies and business models. Conference sponsors, The European Risk Forum, said that if adopted and used well, the principle will raise awareness of the link between regulation and innovation; it will signal to global investors the commitment of the EU to promote innovation, improving business confidence. The total number of employees - partners + non-members - at the end of 2014 was over 1,550. Copma is a co-operative company based in Ferrara, Italy, operating since 1971. Copma is structured to provide high quality services with particular reference to healthcare and hospitals throughout the Country. Copma SCRL, in collaboration with the most important Italian Universities, has developed, in recent years, a cleaning and hygiene system, the PCHS, a tried and tested hygiene protocol which, with the use of probiotics, can significantly reduce the risk of the transmission of healthcare associated infections; reducing direct and indirect costs. “The University of Ferrara, as part of the scientific research carried out on the PCHS, has developed a new method of measuring the level of hospital hygiene. It is called I.Q.M. - ‘Indicators of Microbiological Quality’. These indicators can become a European reference for all operators in the sector, both for who provides the service and for the institutional levels, which govern them. They can measure safety, and help improve safety outcomes. HAIs infect 4.1 million patients annually; and every year, 37,000 people in the EU die as a result of an HAI, even though 20%-30% of these infections are considered to be preventable by intensive hygiene and control programmes.